Shanta Katipamula and Rosie Nelson won the race for ASSU Executive (Courtesy of Kojo Worai Osei). The 15 members of the forthcoming 20th Undergraduate Senate were also selected from a total of 22 candidates. The elections commission also announced new class presidents and next year’s Graduate Student Council members. 76 out of 80 annual grant and special fee groups were approved. A referendum advocating fossil fuel divestment passed in both the undergraduate and graduate bodies. The total undergraduate voter turnout was 57.39 percent, and the total graduate voter turnout was 34.07 percent. Katipamula and Nelson noted that they were “incredibly excited” by an increase in turnout of around 400 voters. The Shanta-Rosie slate — which was endorsed by the First Generation and/or Low Income Partnership, Stanford Daily, Stanford Bioscience Student Association and the Biomedical Association for the Interest of Minority Students — won with 61.92 percent of the vote, beating the Khaled-Ocon slate by 34.6 percent. They also beat the Associated Students of Stanford “joke slate,” which featured John McNelly ’19 and Cale Lester ’19. Katipamula and Nelson ran a campaign based around bringing together undergraduate and graduate students, with the slate itself featuring one of each. They also emphasized their ability to work within the larger institution of Stanford, with a campaign statement that described “working relationships with the highest levels of Stanford’s administration” and a website that highlighted their past work in student government (Katipamula being a former senate chair and Nelson currently a GSC co-chair). Their campaign included promises to advocate for greater community center funding, more long-term housing and transportation options for graduate students, increased Peer Health Educator pay, more diverse Counseling and Psychological Services counselors, for Stanford to use the American Association of Universities sexual assault survey, a block meal swipe option for undergraduates and increased minimum salaries for teaching assistants and resident assistants. One particular policy area which they disagreed with the Aounallah and Ocon on was about the presence of undergraduate students on Title IX panels. During the executive debate a week earlier, it had emerged that Shanta-Rosie opposed adding an undergraduate panel member (due to worries about adequate training for them), while Khaled-Ocon were in favor of adding one (in the name of representation for all affected by the panel’s verdicts). In the 2018 Senate race, 22 candidates competed for 15 seats. Their campaigns focused on issues ranging from University transparency to free speech, mental health to housing. Candidate statements, published on the ASSU website, proposed policies including introducing need-blind admissions for international students, expanding mental health resources and increasing community center budgets. Some candidates campaigned individually, while others joined forces and ran in coalitions. These included A2, Morfin/Diallo, FAM and S.I.D.E. (Students for Inclusion, Diversity and Equality). Gabe Rosen ’19, who promised to increase transparency about Senate meetings as well as support the rights of service workers and course fee reductions. Elected to his third term, Rosen was the only incumbent who sought another term. He received 1,192 votes. Melissa Loupeda ’21, who campaigned for supporting a disability studies program, standardizing student groups funding guidelines and increasing dialogue around sexual assault. Loupeda received 1,190 votes. Jianna So ’21, who championed diversity and service workers in her campaign, as well as proposed changes to the way Stanford addresses sexual assault. So received 1,092 votes. Leya Elias ’21, who promised to create a new community center for first-generation/low-income students, distribute ASSU student group funding more equitably and promote after-dark transportation services. Elias received 1,002 votes. Melody Yang ’21, who advocated for more housing and dining options over winter and spring break, a week-long reading period in lieu of Dead Week and increase community center budgets. Yang received 915 votes. Tyra Nicolay ’21, who called for changes to community centers, fairer allocation of student group funding and more representation for minorities on campus. Nicolay received 896 votes. Martin Altenburg ’21, who promised reforms to the admissions system and community centers, as well as championed programs for first-generation and low-income students. Altenburg received 883 votes. fossil fuels. Nkoy received 846 votes. Jamie Seney ’21, who advocated for supporting undocumented students, improving ASSU transparency and increasing community center budgets. Seney received 782 votes. Zakaria Sharif ’21, who promised more community on campus, advocated for the creation of disability studies and championed workers’ rights on campus. Sharif received 737 votes. Jon Johnson ’21, who emphasized empowering minorities on campus. Johnson received 717 votes. Michal Skreta ’21, who supported expanding meal plan options and increasing transparency about University finances, as well as abolishing printing fees and subsidizing airport rides. Skreta received 715 votes. Faa Diallo ’21, who proposed to subsidize student health care, introduce more meal plan options and encourage greater dialogue on campus. Diallo received 662 votes. Matt Wigler ’19, who proposed to initiate a student-centered cardinal conversations program, advocate for a Disability Studies minor and alleviate financial hardships on students through subsidies. His platform also expressed support for Israel and opposed the Boycott, Divestment and Sanctions movement. Wigler received 457 votes. Wigler received fewer votes than five rising sophomores who sought office, but was elected over them because of an ASSU bylaw that mandates that at least three undergraduate senators be upperclassmen. Last year, this bylaw resulted in a tumultuous Constitutional Council case when Lizzie Ford ’20 was chosen over upperclassman candidate Jacob Randolph ’19 — who received fewer votes than Ford — to replace upperclassman Matthew Cohen ’18 when Cohen was appointed ASSU Chief of Staff by recently-elected executives Justice Tention ’18 and Vicki Niu ’18. The Council determined that the bylaw only applied in elections, not in single-seat vacancies. Ford retained her seat. Rodolfo Salazar ’21 is reported to have the next most amount of votes after Palpatine. All of the senatorial candidates endorsed by the Students of Color Coalition (SOCC) were elected to the Undergraduate Senate. However, the Khaled-Ocon slate, which SOCC also endorsed, was not elected. This fact is unusual given that SOCC endorsements have historically poised candidates for successful outcomes. 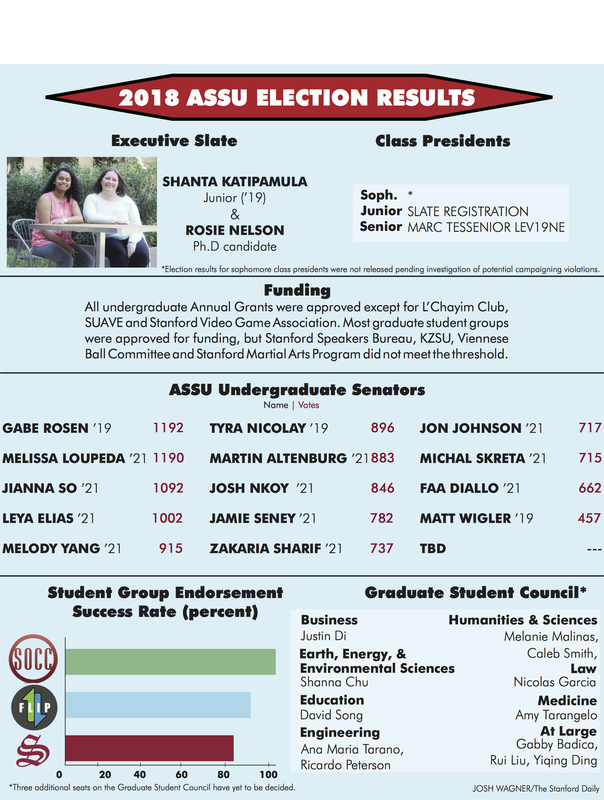 The elected Senators serve at-large on behalf of the student body in one of the ASSU’s six committees: Advocacy, Academic Affairs, Administration and Rules, Appropriations, Communications and Student Life. The MARC TESSENIOR LEV19NE slate — which includes Tashrima Hossain ’19, Aron Tesfai ’19, Nick Pena ’19 and Tony Moller ’19 — was elected senior class president. The slate ran unopposed and promised to help connect rising seniors through events such as senior formal and dorm reunions, as well as host diversity and service-oriented events. The only slate running for junior class president — consisting of Izzy Angus ’20, Will Kenney ’20, Leila Mengesha ’20, Sofia Dudas ’20, Cameron Woods ’20 and Marco Lee ’20 — was also officially elected on Saturday. The slate emphasized accessibility as one of its primary aims, and also promised to offer a wide variety of event programming, volunteer activities and opportunities student-faculty interaction. All 71 undergraduate student groups who applied for Annual Grants were granted funding. Three groups — L’Chayim Club, SUAVE and Stanford Video Game Association — were originally listed as having not been approved, but the results were updated afterwards to reflect that they had, in fact, received funding. In addition, 5 of the 9 graduate student groups were approved for Special Fees. The four groups which did not meet the threshold were Stanford Speakers Bureau, KZSU, Viennese Ball Committee and Stanford Martial Arts Program. The graduate community also elected representatives to their legislative body, the Graduate Student Council (GSC). According to the ASSU, the GSC includes 15 voting members — 10 of whom represent Stanford’s seven schools and five of whom are at-large representatives. Gabby Badica, a graduate student in Iberian and Latin American Cultures who is currently an incumbent on the Council, won the at-large GSC positions. Rui Liu, a Ph.D. Candidate in Electrical Engineering, and Yiqing Ding, a masters student in Engineering, were also elected as at-large representatives. Melanie Malinas, a fourth-year Ph.D. candidate in biophysics, will represent the Natural Sciences graduate district. Having run unopposed for her second term on the Council, Malinas was endorsed by the Stanford Bioscience Student Association and the Stanford Biomedical Association for the Interests of Minority students. In her first term, Malinas has worked on issues ranging from financial literacy to mental healthcare. Nicolas Garcia, a first-year law student, will be the the law school’s district representative. Amy Tarangelo, a biology Ph.D. candidate, will represent the medical school district. Shanna Chu, a Stanford Earth graduate student, will represent the Earth Science district. David Song, an education Ph.D. candidate, will represent the Graduate School of Education. Garcia, Tarangelo, Chu and Song ran unopposed. Ana Maria Tarano and Ricardo Peterson were elected to represent the School of Engineering, and Justin Di will represent the Graduate School of Business. Caleb Smith ’17, currently a coterm in Public Policy, was elected as Social Sciences district representative with two write-in votes — despite the fact that he is graduating this year. Smith, a Daily staffer, said he was “honored and, most of all, surprised.” Smith did not run for the position. “I look forward to spending my one and a half remaining months at Stanford on the GSC working to fix our student group funding system and pressure the administration to develop campus in a prudent and equitable manner,” he wrote to The Daily. This article has been updated to reflect additions to the Graduate Student Council election results and the passage of the Fossil Free Stanford referendum. Graphic courtesy of Josh Wagner. Contact Brian Contreras at brianc42 ‘at’ stanford.edu, Yasmin Samrai at ysamrai ‘at’ stanford.edu, Claire Wang at clwang32 ‘at’ stanford.edu and Courtney Douglas at ccd4 ‘at’ stanford.edu.